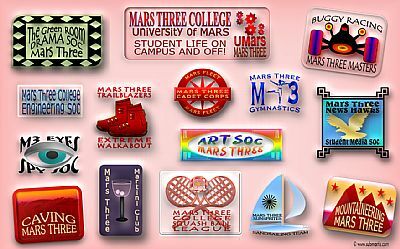 Welcome to Mars Three College, part of the University of Mars! Students have a large variety of activities to take part in outside of study and research hours and many are catered for by our numerous student clubs and societies, several of which are based on campus. One exception that takes our students off campus is the Mars Three branch of the Cadet Corps, where training useful to Mars Fleet can be undertaken in a variety of interesting environments. If physical activity is your thing, we also have Caving and Mountaineering clubs, as well as Buggy Racing, Squash Ball, Sand Sailing and Gymnastics. For those of an inquisitive bent, Mars Three College hosts its own student Multimedia News Society. Whatever your interest, there's a club or society for you - and if there isn't, why not form one of your own? Choose Mars Three College for you tertiary education - it's a lot more than just learning!